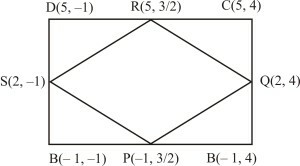 points A(2, –2) and B(3, 7). So, the required ratio is 2 : 9 internally. Q.2 Find a relation between x and y if the points (x, y), (1, 2) and (7, 0) are collinear. Sol. 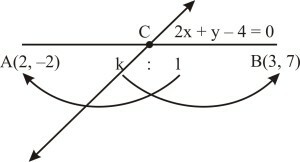 The points A(x, y), B(1, 2) and C(7, 0) will be are collinear. which is the relation between x and y.
Q.3 Find the centre of a circle passing through the points (6, –6), (3, –7) and (3, 3). Sol. 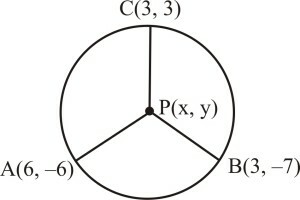 Let P(x, y) be the centre of the circle passing through the points A(6, –6) B(3, –7) and C(3, 3). Then, AP = BP = CP. Thus, the centre of the circle is (3, –2). Q.4 The two opposite vertices of a square are (–1, 2) and (3, 2). Find the coordinates of the other two vertices. Sol. Let ABCD be a square and let A(–1, 2) and C(3, 2) be the given angular points. Let B(x, y) be the unknown vertex. Hence, the required vertices of the square are (1, 0) and (1, 4). Q.5 The class X students of a secondary school in Krishinagar have been allotted a rectangular plot of land for their gardening activity. Saplings of Gulmohar are planted on the boundary at a distance of 1m from each other. 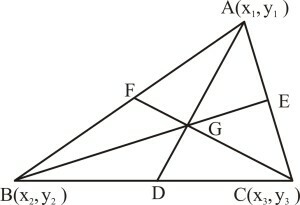 There is a triangular grassy lawn in the plot as shown in the figure. The students are to sow seeds of flowering plants on the remaining area of the plot. (i) Taking A as origin, find the coordinates of the vertices of the triangle. (ii) What will be the coordinates of the vertices of if C is the origin ? Also calculate the area of the triangle in these cases. What do you observe ? (3, 2) and (6, 5) respectively. Thus, we observe that the areas are the same in both the cases. Q.6 The vertices of a are A(4, 6), B(1, 5) and C(7, 2). A line is drawn to intersect sides AB and AC at D and E respectively such that . Calculate the area of and compare it with the area of . Also, form (1), area : area = 1 : 16. Q.7 Let A(4, 2), B(6, 5) and C(1, 4) be the vertices of . 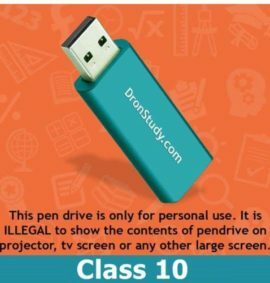 (i) The median from A meets BC at D. Find the coordinates of the point D.
(ii) Find the coordinates of the point P on AD such that AP : PD = 2 : 1. BQ : QE = 2 : 1 and CR : RF = 2 : 1. (iv) What do you observe ? (Note : The point which is common to all the three medians is called centroid and this point divides each median in the ratio 2 : 1). (v) If and are the vertices of , find the coordinates of the centroid of the triangle. Sol. Let A(4, 2), B(6, 5) and C(1, 4) be the vertices of . 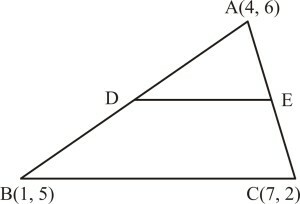 (i) Since AD is the median of , Therefore, D is the mid-point of BC. Its coordinates are ,i.e., .
. This point is known as the centroid of the triangle. (v) Let and be the vertices of whose medians are AD, BE, and CF respectively. So, D,E and F are respectively the mid-points of BC,CA and AB. 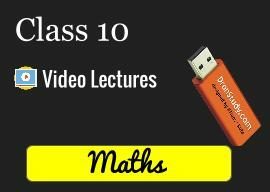 Q.8 ABCD is a rectangle formed by joining the points A(– 1,–1), B(– 1, 4), C(5, 4) and D(5,–1). 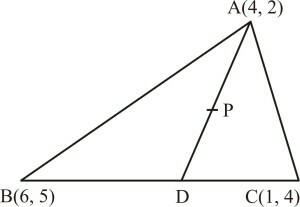 P, Q, R and S are the mid-points of AB, BC, CD and DA respectively. 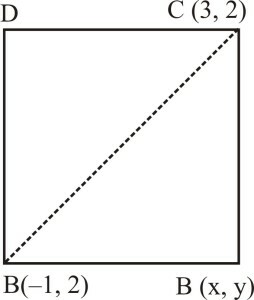 Is the quadrilateral PQRS a square ? a rectangle ? or a rhombus ? Justify your answer. Sol. Various points are marked in the adjoining figure. 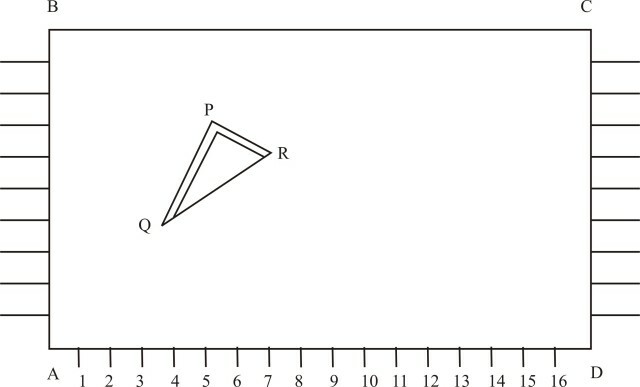 therefore, PQRS is a rhombus. It's very helpful to us... Best website ever..
helped a lot .... thnks!